OK - Even I'm getting bored with this, but I scanned in all of these and I want you to suffer as much as I have. 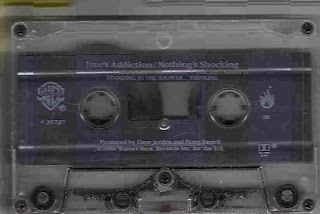 Yes, I might not appear to be the typical Jane's Addiction fan, but this album is incredible and it brings back a ton of good memories. 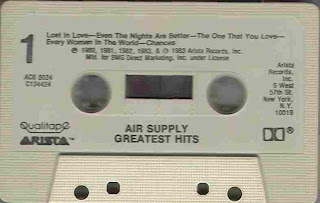 Yep, I've mentioned Air Supply before. I have this on LP also. It has sentimental value and freaks out people when you pull up to the post office with it blaring full blast. Grayson Hugh - I don't understand the cap, but he was (and still is, I'm sure) a great singer. 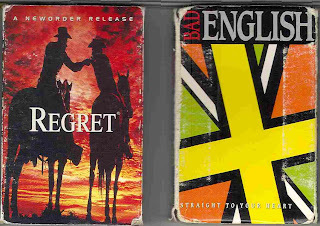 INXS - a good summer time song - reminds me of Burger King for some reason, but those memories are old and in black and white now. 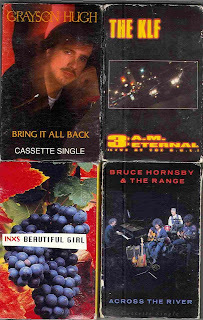 "Across the River" - my vote for the best Bruce Hornsby song of all time. I love New Order and I hear this one regularly on XM. 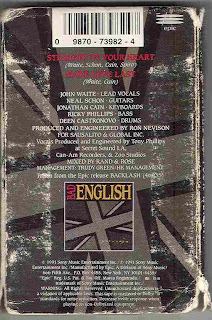 Finally, Bad English (led by John Waite) - both songs on this one are incredible so I even scanned the back so you can search for it on a legal mp3 site. It's weird, but I think Zac Efron sounds a lot like John Waite. So, that's it. I scanned these in a while back. Thought it would be a fun blog topic. Well, at least I got to prove what a freak I am when it comes to music. Back on the road tomorrow. Another town, another Hampton Inn. At least I have a nice 5 hour drive to catch up on "This American Life" and all of my other podcasts. Good night!